Earlier this year Skout shifted gears, shedding its role as a traditional location-based social network in the same vein as Brightkite to become a network exclusively focused on location-based dating. It’s now primarily centered around its iPhone application, which launched in January and was one of the iPhone’s first dating apps. But until now its web presence has failed to properly reflect its shift to dating, presenting users with a clunky social network that the Skout team didn’t pay much attention to. Today, Skout is looking to fix that with a revamped and simplified homepage that makes flirting its top priority. The site now primarily revolves around a location-based feed, which anyone in your region can post status updates and photos to. There’s also a ‘hotlist’, which allows users to ‘follow’ the actions of the users they find interesting (the site has swapped its Facebook-like friending system to a Twitteresque following model, so you can follow people you don’t know). The site now also more prominently features a chat area, and allows you to ‘wink’ at people. And that’s about it. The simplicity makes the site easy to navigate, but I can’t help but feel that Skout might have become a little too basic - there just doesn’t seem to be a whole lot going on. That may not prove to be too much of a problem though, as the site is really only meant to serve as an extension to the iPhone app. The company is reporting around 2000-3000 new users sign up per day, with 15,000 unique logins on a daily basis. I’ve previously expressed my reservations about Skout - namely, I question if there’s really room for yet another dating site (I suspect some of the more established players will release location-based apps of their own). But it’s also doing some smart things, like bringing a new product called Skout OUT to bars and clubs, which users can interact with on digital screens (the company currently has some major deals in the works on this front). 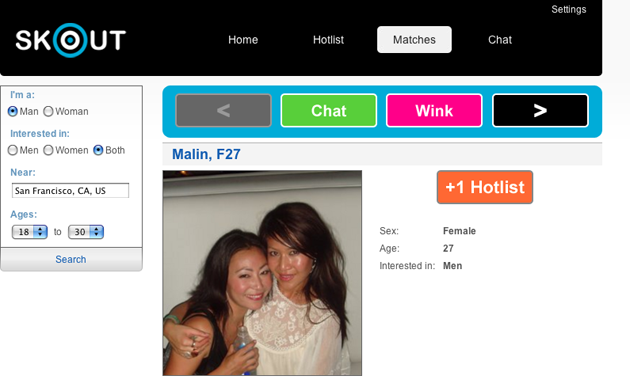 And it’s also beginning to white label its network, allowing sites to offer their own branded dating apps that are pre-populated with Skout users.